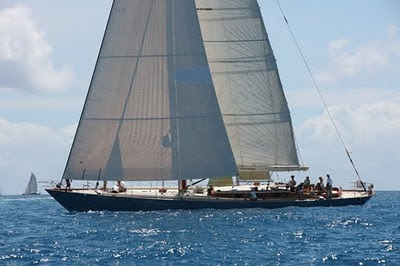 Sailing yacht Volterra is a modern classic sailing yacht designed to circumnavigate the world in comfort and style. While she has indeed traced a stern wake around the globe, she has also distinguished herself on the race course in the Mediterranean, the Caribbean and the Atlantic. Her design is an achievement of collaboration between German Frers and John Alden, endowing her with fast, classically elegant lines. Her Palmer-Johnson pedigree guarantees a strong, seaworthy luxury yacht. Her comfortable and airy interior was designed by John Munford and executed in solid cherry wood. The large cockpit offers ample elbow room to an active racing crew as well as a comfortable space for owner and guests for a full service moonlight dinner. Volterra accommodates 4 guests and a crew of three or 6 guests with a crew of 2. There are port and starboard guest cabins, each with two single beds and adjoining bathrooms with showers. Two additional bunks are provided in the main salon, enclosed by a privacy curtain. The owners cabin located midships offers two beds, one extends to a full double bed. The owner's cabin also offers a comfortable settee with a fold down work desk and a well appointed bath room with shower stall. Click here for charter availability and rates.